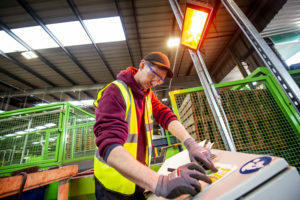 Wooden pallets manufacturer and pooler IPP Logipal has invested over £2.5 million in a new automated pallet inspection and repair service centre in Bardon Hill, Leicestershire which is set to process over three million reusable pool pallets each year. The new automated system will process in excess of 700 pallets per hour and the capacity to process six million each year. “We have invested in high-end equipment which means that ‘healthy’ pool pallets will be back on the road sooner and damaged ones will be efficiently and quickly repaired in double quick time,” said IPP UK director Phil Storer. IPP has entered into a long-term agreement with timber processing group James Jones Group to operate its new site, replacing IPPs existing facility near Glenfield. IPP is “confident the new service centre and its teams will be in very professional, safe and supportive hands,” added Storer. IPP has also signed a long-term lease on the Interlink Business Park in Bardon Hill, Coalville. Its investment is the biggest IPP service centre of its kind in Europe.